Microsoft has finally revealed the date when the Surface Pro will go on sale and after slight delays, we will see it hitting stores on February 9, but that is only in the US and Canada to begin with. Surface General Manager Panos Panay tweeted that he was off to the Surface factory to see the Pro units shipping “in the coming weeks”, Surface Pro will be exactly the same as what Microsoft showed at CES to some lucky viewers. Microsoft has confirmed that the Surface Pro will be shipping out on February 9 and have released prices for both units, which we already know. The 64GB model will cost $899 and the 128GB model will cost $999. In our view, if you are going to spend a lot on this tablet/PC hybrid, then you might as well get the 128GB model. 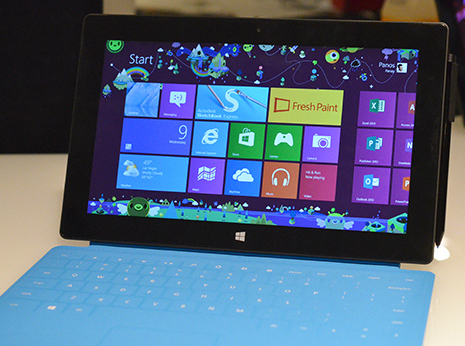 The Surface Pro will have an Intel Core i5 processor with Intel HD Graphics 400, with 4GB of RAM. Intel launched a new range of low-power processors at CES, we suspect that if Microsoft and Intel are as close partners as we suspect they are, the Surface Pro will be fitted with these new units. Many were confused by the Surface RT, at a low tablet price point and running a degraded version of Windows 8, many were put off by it. We have said that we actually find the Surface RT to have good hardware and, when developers decide to make apps for it, a good ecosystem. The Surface Pro is definitely more PC then tablet, the price point, the hardware and the software it can run all point to a Windows 8 PC. As Lenovo said, we are living in a PC-plus world, not a post-PC world. The question is will users accept this new form factor and spend $900 on the Surface Pro.